Join Old Tin Shack on their Love Gone Bad tour, two days after Valentine's day! Russ Godfrey on guitar, Derek Walsh on harmonica, and Rick Van Krugel on mandolin. 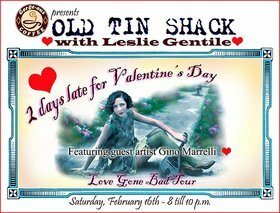 Leslie Gentile joins on vocals + Gorge-ous Coffee's co-owner Gino Marrelli opens with Italian love songs!